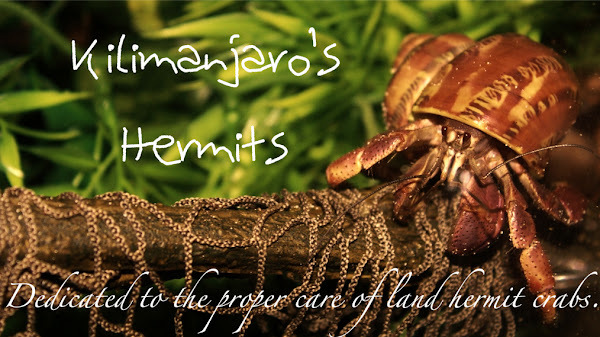 Kilimanjaro's Hermits: Making a comeback! I am going to resume regular blogging here on Kilimanjaro's Hermits! Stay tuned for updates, crab care articles, and more. Here is a small update for now. The 55G crabitat is currently home to 9 hermit crabs: three Purple Pinchers, three Violas, two Ruggies, and an Indo! I am planning to add some new Ecuadorians to the crabitat soon. Here is the current set-up of the 55G crabitat. I got rid of my two filtered pools because the crabs continuously dislodged the filters, causing them to spew water out into the tank and making a soppy mess out of the substrate! The two pools now are equipped with airstones and I do weekly water changes. Everyone has been very active lately, save the four crabs who are molting. I included a picture of Shinto with this post! He is looking gorgeous as ever. Your blog is very interesting, hopefully you'll write often, cause your articles are really good.